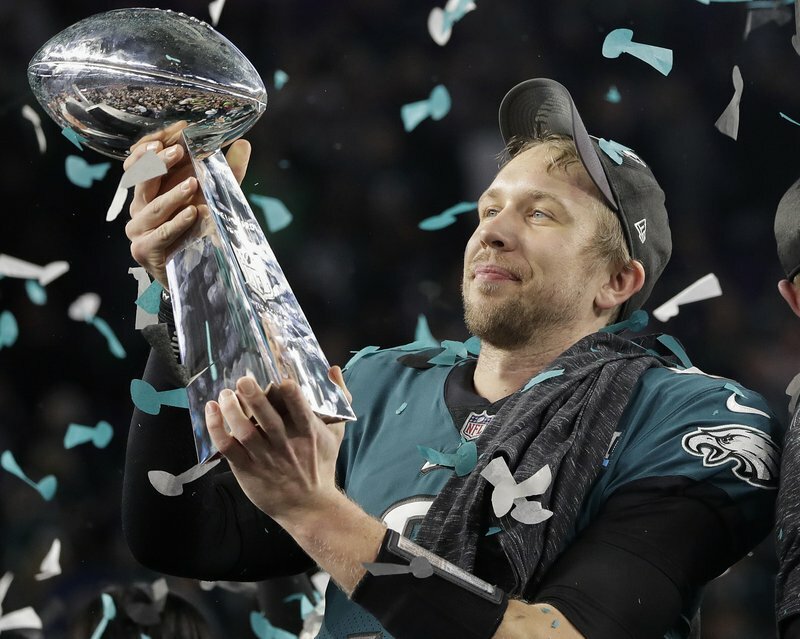 Nick Foles did his best Tom Brady impersonation, leading a late-game comeback to cap a season that began as a backup and ended as Super Bowl MVP. Foles finished it off by engineering the type of game-winning drive that made Brady famous, and he watched his defense stop Brady to seal the victory and the Eagles first Super Bowl – their earlier titles came before the Super Bowl era. One of those teammates delivered the key defensive play on a night when the offenses combined for 1,151 yards – the most in any modern NFL game. With Brady poised to lead one of his memorable comebacks, Brandon Graham knocked the ball out of his hand for a fumble that rookie Derek Barnett recovered with 2:09 to play. That gave the Eagles a 22-12 halftime lead but Brady led three straight second-half touchdown drives – two to Gronkowski. Foles kept pace with a 22-yard touchdown pass to Clement and another drive for a field goal that kept the Eagles in it until the dramatic finish.